Beach Ball embroidered bespoke cotton beach bag. 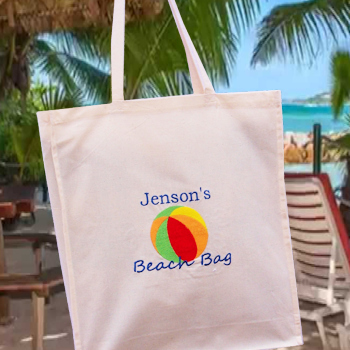 Beach Ball embroidered bespoke cotton beach bag. Great size to hold the towel, sun block, glasses and book. Sturdy over the shoulder length handles. Beach Ball embroidered bespoke cotton beach bag. Great size to hold the towel, sun block, glasses and book. Sturdy over the shoulder length handles. Exclusively designed by Amys Gifts, not available on the High Street. Personalised with a name or nickname of your choice! This all cotton tote bag measures 38x43cm with a 10cm gusset so it holds plenty of goodies. Features long handles so it can be fashionably hung over the shoulder. Perfect for the beach, weekends away, hobbies, books or shopping.